Public School Districts in Mitchell County with links to websites, along with the name of each school's mascot. Mascots' names and background to mascots are in each schools' colors. *Portion of Colorado ISD is in adjoining Scurry County, Texas. **Major portion of Forsan ISD is in adjoining Howard County, Texas. ***A major portion of Ira ISD is in adjoining Scurry County, Texas. ****Portion of Roscoe ISD is in adjoining Scurry, Fisher, and Nolan Counties. *****Portion of Synder (top left corner) ISD extends in adjoining Scurry, and Kent, Counties. Thanks for using our directory! This page is being upgraded. 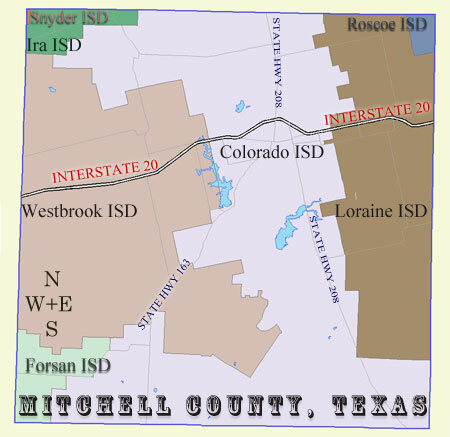 Map of Public School Districts within Mitchell County, Texas*. *Portions of the above map courtesy of TEA. Arrive alive, don't text and drive!